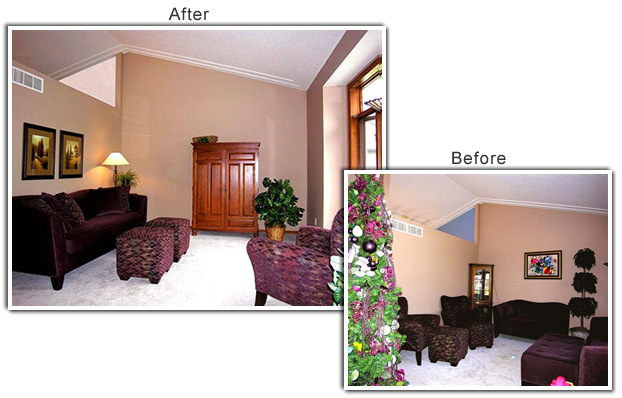 The Room: A living room in a Chaska house. The Problem: Too many furnishings made the living room feel unusually small, dark and cramped. To free up space and create a sense of continuity between the upper and lower levels, the loveseat was put in storage and the ottoman, one of two matching chairs and a bookcase (not shown) that blocked light were moved to the lower-level family room. To anchor the setting and play up the tall ceilings, a heavy oak wardrobe from the upstairs master bedroom was used in the dining room. The wardrobe mimics the feel of an entertainment center and gives buyers a sense of how the room could be used. To create a more inviting furniture arrangement and to give the room balance, the sofa was moved to the wall opposite the windows. Using two small ottomans as a coffee table keeps the space from looking cluttered. Putting the occasional chair at an angle adds visual interest and gives the room a conversational feel. Because the living room has no overhead lighting, Matzke put a floor lamp and table lamp in opposite corners of the room. Washing the large picture windows also ensured that the room would be flooded with light. Greenery helps draw the buyer's eye around the room, while artwork found in an upstairs closet was hung over the sofa to add color and balance, and to give the space a finished feel. To avoid color clash and keep buyers focused on the living room, the kitchen wall was painted white. The homeowners made other improvements to the house, including fresh paint and new deck stain. The house sold in just nine days, with multiple offers.